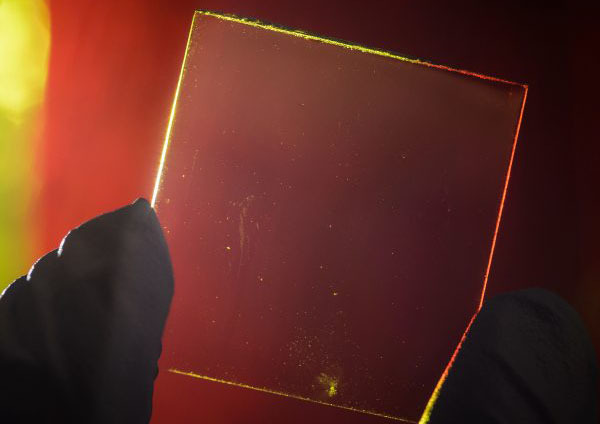 Researchers from Michigan State University have developed see-through solar panels. Completely transparent, these new panels will offer solar energy collection to more aesthetic areas of architectural design, and possibly even power mobile phones and cars. The research team, already having an engineering formula that worked has come up with a transparent luminescent solar concentrator (TLSC) that can function as a coating over clear surfaces, harvesting solar energy without affecting the function of the surface to let in light. The technology employs organic molecules, which function on a light wavelength not visible to the human eye. 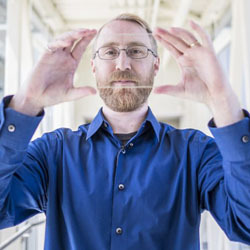 Dr. Richard Lunt, assistant professor of chemical engineering and materials science at MSU’s College of Engineering, explained, “We can tune these materials to pick up just the ultraviolet and the near infrared wavelengths that then ‘glow’ at another wavelength in the infrared. The design is ideal for use in architecture. As more solar energy can be harvested from the surface area of a building’s facade, TLSC could offer a significant energy impact on tall buildings. TLSC-coated glass would not affect the look of the building or compromise the architectural design while adding energy collection technology to new and existing properties, as the technology could also be integrated into old buildings. If they prove commercially viable, Dr. Lunt continued, the power they generate could “significantly offset the energy use of large buildings.” The university research team has received funding from the Center for Excitonics, an Energy Frontier Research Center financed by the Department of Energy, to continue their innovative research into the energy-producing efficiency of the transparent cells. Dr. Lunt believes that some basic modifications, such as stacking the cells, could increase TLSC efficiency from 1 percent to around 10 percent.